West Ham got back to winning ways as Southampton's dismal run in the Premier League continued with a 3-1 defeat at St Mary's. Deadline-day signing Manolo Gabbiadini fired Saints ahead just 12 minutes into his debut, but that was as good as it got for the hosts. Andy Carroll equalised within two minutes, Pedro Obiang added the second before half-time and a Steven Davis own-goal left EFL Cup finalists Southampton with just three points from the last 21 available. It also meant a winning return to the south coast for former Saints captain Jose Fonte, who left to join West Ham a fortnight ago. The Portugal defender endured a torrid debut in the 4-0 midweek defeat by Manchester City - and he was conspicuous by his absence when Southampton took the lead. Jay Rodriguez's speculative ball somehow caught out the West Ham defence, looping over Fonte and Cheikhou Kouyate into the path of Gabbiadini. The B#17million new boy still had plenty to do as he cut in from the left but his powerful angled drive rocketed past Darren Randolph and in off the underside of the crossbar. Yet within two minutes Southampton's defence, minus the injured Virgil van Dijk as well as Fonte, went missing themselves. 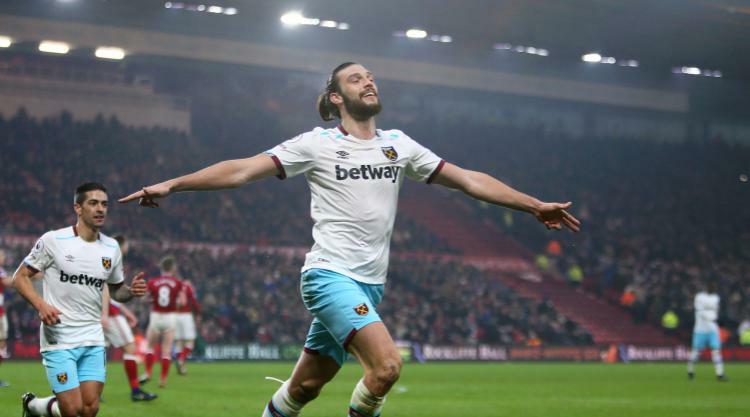 Obiang's pass forward did not look particularly menacing but it dissected centre-halves Maya Yoshida and Jack Stephens, allowing Carroll to slot in his sixth goal in 12 games. Saints keeper Fraser Forster did well to beat out Aaron Creswell's shot before the left-back's cross found Sofiane Feghouli, who could not convert at the far post. At the other end Gabbiadini glanced a Cedric Soares cross wide, but when the crucial second goal did arrive it came from an unlikely source. A minute before half-time Robert Snodgrass' corner was headed out to Obiang, who was loitering some 30 yards out. The Spanish midfielder, by no means known for his shooting, sent a low drive through a crowd of players which seemed to deceive Forster as it crept inside the far post for his first Hammers goal. Saints came out after the break determined to claw themselves level, with James Ward-Prowse forcing a sharp near-post save from Randolph and Cresswell denying Gabbiadini a second with a vital block. But seven minutes after the restart West Ham won a free-kick down the left, Mark Noble swung it towards goal and Davis stuck out a foot to inadvertently hook the ball into his own net. Gabbiadini had the chance to pull one back but skied his effort from 12 yards out and Randolph held Davis' drive to secure a welcome three points and lift the Hammers back into the top half.